Manchester United were deservedly beaten by their rivals Manchester City this past weekend, and as expected, much of the post-match talk revolved around the inability of the Red Devils to get the job done again in the Premier League. On Sky Sports, the discussion quickly turned to whether this particular Manchester United team was performing to its best ability, and whether manager Jose Mourinho was able to bring out the best from his current crop of players. On one end of the spectrum was former Liverpool star Graeme Souness, while on the other end stood United legend Gary Neville. The duo clearly had differing views on United, with Souness claiming that Mourinho was to blame for his side’s inefficiency, while Neville supported the Portuguese and hailed his ability to win trophies with some of the biggest clubs in the world. Needless to say, the debate got pretty heated. Some of the action from the debate can be seen via this Twitter post by Sky Sports, where Souness passionately argues his case, with Neville looking seemingly lost for answers. 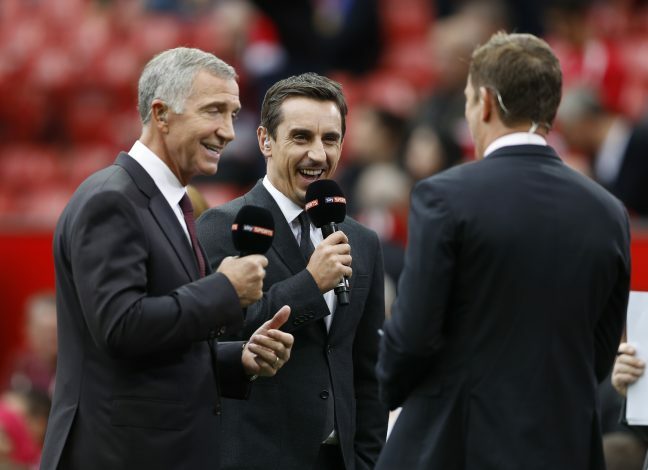 At one point, Souness outright asks Neville whether United playing the way they are is acceptable, and the latter is unable to give a clear response. The two went back and forth for a little while longer over the matter, but Neville eventually stood firm on the fact that Mourinho should not be sacked considering his past success, and that he backs him to get through the pickle United find themselves in.